Almost 40 years has passed since the formation of the Islamic Revolutionary Guards Corps, recently designated as a foreign terrorist organization by the US. The powerful Iranian Guards, controlled by the regime’s Supreme Leader, have long since expanded its grasp in political, economic, and security- intelligence affairs in Iran. The founder of the Islamic Republic of Iran, Ruhollah Khomeini announced the establishment of the IRGC on April 22, 1979, a few months after the Shah was toppled. According to Article 150 of the Constitution, the Revolutionary Guard Corps is tasked with “guarding the revolution and its achievements.” The commanders of the IRGC have long since interpreted this duty as “unconditionally” following the Supreme Leader and confronting any movement that might weaken the Leader’s authority. It is clear that nothing has been spared from the IRGC’s malicious tentacles in Iran; from commercial fleets to road construction, oil trade, banking, telecommunications, heavy industries, and any other lucrative business in Iran. The Islamic Republic of Iran is based on the absolute rule of the Supreme Leader or the Faqih, led by Khamenei, at the head of all affairs of the country. A rule which is not based on popular elections and is a lifelong tyranny. The question is how the Iranian regime, hated by the majority of Iranians, has been able to maintain its hold on power for four decades despite widespread protests against its rule. Suppression and quelling dissent has been the regime’s main leverage for survival. The regime’s suppression campaigns, which is at times complex, had led to “absolute” tyranny. The Islamic Revolutionary Guards Corps who get their motivation and power for suppression through the unofficial occupation of regional countries, is the only force powerful enough to suppress the more than 80 million population of Iran. Since Khomeini rose to power, one of the main slogans he vehemently promoted was “the conquering of Jerusalem through Karbala”. It was with this motive that Iran continued the war with Iraq even after Iraq pulled out of Iran and even now, has not signed a peace treaty with its western neighbor. The “Guardianship of the Islamic Jurist” a term and ideology espoused by Khomeini as a way to establish his absolute rule in Iran, bypasses the sovereignty of other countries to export its “revolution”. The regime does not consider this a clear intrusion in the affairs of its neighbors and other states but rather its inalienable right to expand the “Shiite Empire of Iran” to the whole region. According to Ahmad Alamolhoda, a senior cleric and head of Friday Prayers in the city of Mashhad, through this ideology, the regime has expanded its borders to Iraq, Damascus and all the way to the Mediterranean coast. 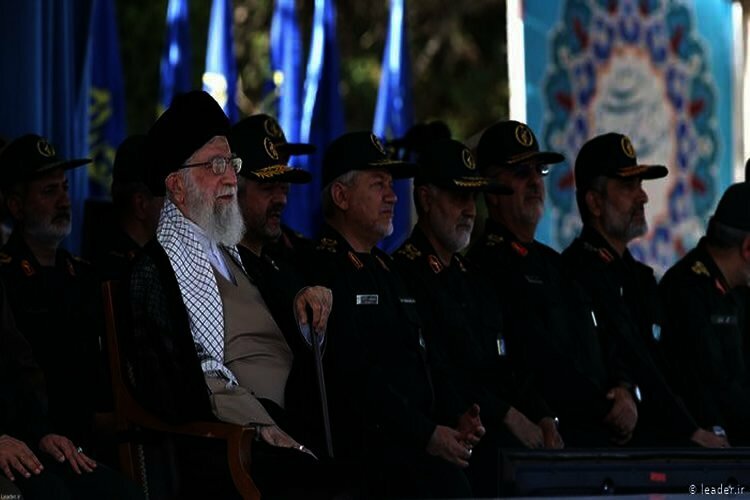 The hardline cleric believes that the presence of the Iranian regime in these regions is very natural considers these countries inside Iran’s realm. The intervention of the Quds Force, a unit of the IRGC directed to carry out unconventional warfare and intelligence activities, began in 2003 in Iraq, after Saddam was toppled. Now, dozens of Iraqi militant groups are carrying out malicious activities under the auspices of the IRGC in Iraq. During the seven years of devastating war in Syria, Bashar al-Assad’s main source of finance and military might came from the IRGC. According to the regime’s political literature Syria is a member of the “anti-Zionist resistance axis” and a “communicative bridge” to Lebanon’s Hezbollah. “Syria is the communicative bridge between Iran and Lebanon’s Hezbollah. To confront the threats of the Zionist regime we support Syria, therefore, helping Syria and Lebanon is Iran’s strategy in terms of our defense policy,” Rahim Safavi, Khamenei’s special military advisor said. The IRGC is fueled by this strategy, and carries out its malevolent operations externally and suppresses dissent at home, making it the most important defense mechanism of Iran’s Supreme Leader. If such a possibility of warmongering did not exist in the region, and without the wars in Iraq and Syria, the regime could not have used it to stay in power for 40 years. Now that the IRGC was designated by the US, we are sure to see important developments in Iran and the region. The designation places serious restrictions on the Guards and curbs its trade and financial and commercial transactions, as well as its terrorist and warfare activities. All of these will lead to the impotence and disappointment of IRGC members who will leave the Guards, which will in turn embolden Iranians to rise and revolt against the regime.